Yes, the 17057530 would be the best carb to use. Be very careful removing the ring you can crack or break the airhorn as it's very thin in that area. I use a small thin screwdriver and gently pry them out. You may have to grind one to a knife edge to get under it. The accl pump is installed into the airhorn first, then the boot, then the retaining ring. I use a hole punch to seat the ring but make sure you have excellent support under it before driving the ring down as it's easy to break the airhorn in that area. Have my Cliff kit but trying to figure how to replace the Accel pump boot and retainer. Old boot ripped a bit so I pulled it out. There's a ring in the well but cant figure if it comes out or not or if it does come out how? Then how to install the new one?? 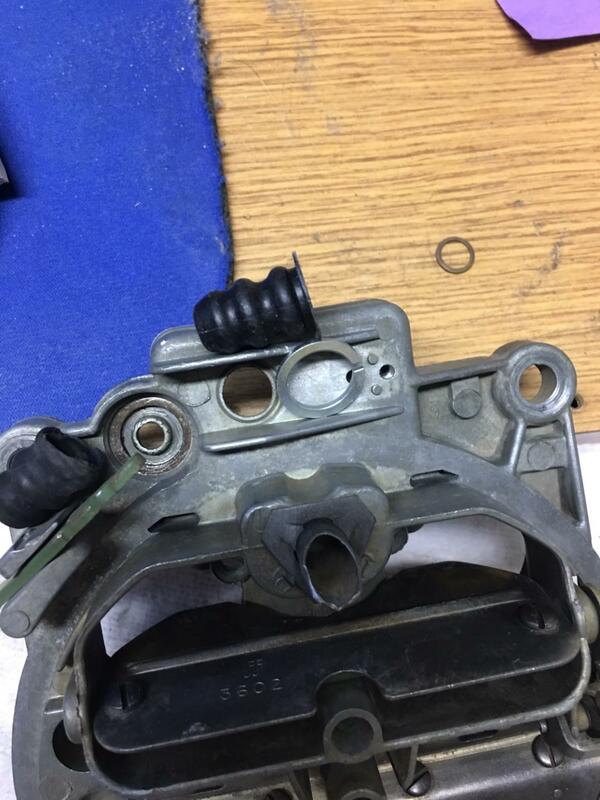 Quadrajet Carb Talk and Tips / Re: 350 having detonation problems. Move up to the 214/224/112 cam and it will lower dynamic compression close to 1 point. Another option is to simply retard the timing till it doesn't ping. Decades ago I built a 400 SBC with flat top pistons and 76cc heads and installed a small cam in it. Had to run the initial timing down around 4 degrees and total at 26, but it ran over 100,000 miles and made TONS of power everyplace. I also added 8 degrees from the vacuum advance. .... Problem is, I have my timing retarded to 8* initial, and 28* mechanical and still have slight detonation around 3500-3800 RPM's -I have to estimate because I don't have a tach. There is an additional 12* VA on top of that, but I get the same detonation whether the VA is hooked up or not. Quadrajet Carb Talk and Tips / 350 having detonation problems. I just got my set of 191 TBI heads cc'd last week and they were 65 cc. 193 castings will be the same FYI. You may want to check your static compression again unless you've worked the combustion chamber then ignore me. I put a "torque cam" in it trying to make a good truck motor. Problem is, I have my timing retarded to 8* initial, and 28* mechanical and still have slight detonation around 3500-3800 RPM's -I have to estimate because I don't have a tach. Duration at 050 inch Lift: 204 int./214 exh. Advertised Duration: 278 int./288 exh. Intake Valve Lift with Factory Rocker Arm Ratio: 0.420 in. Exhaust Valve Lift with Factory Rocker Arm Ratio: 0.433 in. Valve Lift with Factory Rocker Arm Ratio: 0.420 int./0.438 exh. I don't want to swap springs if I don't have to, and I would like to keep the RPM Power Range as low as possible. anyone have any cam suggestions ? Can I fix this problem with a simple cam swap? Should I just buy different heads? ---Really don't want to. I ordered the SR kit for the 17057530, hope this works. I would like to rebuild one carb to use on either my Cadillac 425 ci. or Cad 500 ci. motor. I will run either engine in my '69 Chev. Truck Camper Special and occasionally have a cab over camper with a total 7,500 GVW. Stock or mild cam, pocket ported heads, HEI, MSD 6A box, and headers. Which would be the best carb to rebuild? Can I run the 425 carb on the 500 by just swapping in the 500 carb jets, secondary rods? I am not required to run EGR in the '69 truck and wasn't planning on it. Both Cad motors had EGR manifolds. Will I need jetting changes?